DISCLAIMER: For use by the trained and knowledgeable “competent person” only. Refer to the appropriate requirements of your local city, county state, federal regulations and/or manufacturer’s tabulated engineering for further clarification. Excavation: Any man-made cut, cavity, trench, or depression in an earth surface, formed by earth removal. Competent person: One who is capable of identifying existing and predictable hazards in the surroundings, or working conditions which are unsanitary, hazardous, or dangerous to employees, and who has authorization to take prompt corrective measures to eliminate them. Intent: In order to be a “competent person” for the purpose of this standard, one must have had specific training in, and be knowledgeable about, soil analysis, the use of protective systems and the requirements of this standard, and must be designated by the employer. Inspections: Daily inspections of excavations, the adjacent areas, and protective systems shall be made by a competent person for evidence of a situation that could result in possible cave-ins, indications of failure of protective systems, hazardous atmospheres, or other hazardous conditions. An inspection shall be conducted by the competent person prior to the start of work and as needed throughout the shift. Inspections shall also be made after every rainstorm or other hazard increasing occurrence. These inspections are only required when employee exposure can be reasonably anticipated.  Protecting surface encumbrances that may create a hazard to employees.  Spoil piles shall be at least 2 feet away from the excavation edge.  Locating underground installations prior to opening an excavation.  Providing appropriate access & egress at 4 feet deep or more.  Reducing employees exposure to vehicular traffic with the use of warning vests or highly visible garment.  Employee exposure to falling loads shall be eliminated, wear hard hats.  Providing a warning system for mobile equipment operating adjacent to or near an excavation.  Testing the air in excavation to identify potentially hazardous atmospheres at 4 feet deep or more.  Protection from hazards associated with water accumulation.  Ensuring the stability of adjacent structures.  Adequate protection of employees from loose rock or soil that may fall or roll into an excavation.  Daily inspections by a competent person.  Appropriate Fall Protection near excavations at 6 feet deep or more. Type A Soil - Cohesive soils with an unconfined, compressive strength of 1.5 ton per square foot (tsf) (144 kPa) or greater. and, in some cases, silty clay loam and sandy clay loam. Cemented soils such as caliche and hardpan are also considered Type A. The soil is subject to vibration from heavy traffic, pile driving, or similar effects. The soil has been previously disturbed. The soil is part of a sloped, layered system where the layers dip into the excavation on a slope of four horizontal to one vertical (4H:1V) or greater. The material is subject to other factors that would require it to be classified as a less stable material. Type B Soil - Cohesive soil with an unconfined compressive strength greater than 0.5 tsf (48 kPa) but less than 1.5 tsf (144 kPa). Granular cohesionless soils including: angular gravel (similar to crushed rock), silt, silt loam, sandy loam and, in some cases, silty clay loam and sandy clay loam. Previously disturbed soils except those which would otherwise be classified as Type C soil. Dry rock that is not stable. (4H:1V), but only if the material would otherwise be classified as Type B. Type C-60 Soil - Moist, cohesive soil or a moist dense granular soil that does not fit into Type A or Type B classification and is not flowing or submerged. This material can be cut with near vertical sidewalls and will stand unsupported long enough to allow vertical shores to be properly installed. water or flowing soil entering the excavation around or below the sheeting. An alternate design for less stable Type C soil will be required where there is evidence of deterioration. Cohesive soil with an unconfined compressive strength of 0.5 tsf (48 kPa) or less. Granular soils including gravel, sand, and loamy sand. Submerged rock that is not stable. Material in a sloped, layered system where the layers dip into the excavation or a slope of four horizontal to one vertical (4H:1V) or steeper. Visual analysis is conducted to determine qualitative information regarding the excavation site in general, the soil adjacent to the excavation, the soil forming the sides of the open excavation, and the soil taken as samples from excavated material. Observe samples of soil that are excavated and soil in the sides of the excavation. Estimate the range of particle sizes and the relative amounts of the particle sizes. Soil that is primarily composed of fine-grained material is cohesive material. Soil composed primarily of coarse-grained sand or gravel is granular material. Observe soil as it is excavated. Soil that remains in clumps when excavated is cohesive. Soil that breaks up easily and does not stay in clumps is granular. fissured. Small spalls are evidence of moving ground and are indications of potentially hazardous situations. Observe the area adjacent to the excavation and the excavation itself for evidence of existing utility and other underground structures, and to identify previously disturbed soil. Observed the opened side of the excavation to identify layered systems. Examine layered systems to identify if the layers slope toward the excavation. Estimate the degree of slope of the layers. Observe the area adjacent to the excavation and the sides of the opened excavation for evidence of surface water, water seeping from the sides of the excavation, or the location of the level of the water table. Observe the area adjacent to the excavation and the area within the excavation for sources of vibration that may affect the stability of the excavation face. Manual analysis of soil samples is conducted to determine quantitative as well as qualitative properties of soil and to provide more information in order to classify soil properly. Plasticity: Mold a moist or wet sample of soil into a ball and attempt to roll it into threads as thin as 1/8-inch in diameter. Cohesive material can be successfully rolled into threads without crumbling. For example, if at least a two inch (50 mm) length of 1/8-inch thread can be held on one end without tearing, the soil is cohesive. Dry strength: If the soil is dry and crumbles on its own or with moderate pressure into individual grains or fine powder, it is granular (any combination of gravel, sand, or silt). If the soil is dry and falls into clumps which break up into smaller clumps, but the smaller clumps can only be broken up with difficulty, it may be clay in any combination with gravel, sand or silt. If the dry soil breaks into clumps which do not break up into small clumps and which can only be broken with difficulty, and there is no visual indication the soil is fissured, the soil may be considered unfissured. 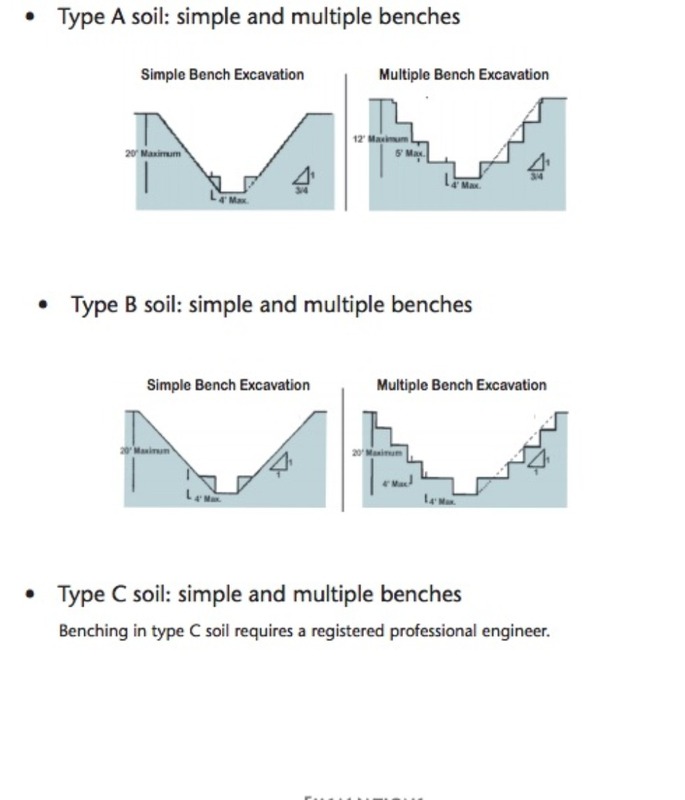 Thumb penetration: The thumb penetration test can be used to estimate the unconfined compressive strength of cohesive soils. Type A soils with an unconfined compressive strength of 1.5 tsf can be readily indented by the thumb; however, they can be penetrated by the thumb only with very great effort. Type C soils with an unconfined compressive strength of 0.5 tsf can be easily penetrated several inches by the thumb, and can be molded by light finger pressure.